TEHRAN, Iran – President Mugabe and his wife the First Lady Grace Mugabe on will use their visit to Iran to thresh out sticking issues on the longstanding deal to supply uranium to, a high level government official accompanying the President revealed to the The Zimbabwe Mail last night. On Friday Iranian Foreign Minister Mohammad Javad Zarif held talks with the Zimbabwean Foreign Minister Simbarashe Mumbengegwi and other senior government officials from the mines ministry and discussed new details of bilateral agreements including the sale of uranium to Zimbabwe. Zimbabwe has in place longstanding bilateral agreements with Iran to sell materials for its nuclear weapons program, according to media reports and sources said President Mugabe will hold sideline meetings with the incoming Iranian President to get his commitment to the uranium deals. Iran insists that its nuclear programme is solely for providing its domestic energy needs, however it is widely believed they are hoping to build a nuclear weapon. President Robert Mugabe is in the capital Tehran to attend the swearing-in ceremony of Iranian President Hassan Rouhani. According to the Islamic Republic News Agency, Rouhani was expected to be sworn in on Saturday afternoon in a ceremony set to be attended by senior officials from 92 countries. Rouhani had a landslide victory in May this year and he will be sworn-in for his second term. “Eight presidents, 19 parliament speakers, nine vice presidents and prime ministers, seven parliament vice-speakers, 11 foreign ministers and 35 special envoys from different countries will reportedly attend the ceremony,” the report said. Last night a senior government official told The Zimbabwe Mail that President and the First Lady Grace Mugabe were determined press the new Iranian government to fulfill the outstanding terms for the deal for the sale of uranium deposits to Iran. The deal signed in 2010 is in direct contravention of international sanctions imposed on both Tehran — for its nuclear ambitions — and the Mugabe government — for its human rights abuses. Secret negotiations between the two countries took more than two years to accomplish. In 2015 the United States Obama administration and other six countries signed a deal with Iran to trying stop it to develop nuclear weapons, and Russia, China, Britain, France and Germany blessed warmed up to the agreement. The deal has also meant European countries flocking back to invest in oil-rich Iran, with France’s Total agreeing to develop a new phase of the South Pars gas field, the world’s largest. The deal for the sale on uranium deposits was reportedly signed in 2010 and it is in direct contravention of international sanctions imposed on both Tehran — for its nuclear ambitions — and the Mugabe government — for its human rights abuses. Secret negotiations between the two countries have been ongoing for more than two years, according to the report. Zimbabwe has denied that is has signed an agreement that with Iran to provide raw material needed for the development of a nuclear weapon. “We have no capacity to handle uranium as a country, and besides we don’t even know the quantity of uranium deposits viable for mining,” a senior government official told the media. Robert Mugabe — Zimbabwe’s long-time president, who is vying for an eight term in office— has in the past described Tehran’s quest for nuclear power as a “just cause.” The international community suspects that Iran is building a nuclear bomb, despite the Islamic Republic’s claims that its program is for domestic purposes only. In 2010, Mugabe prompted speculation of the deal when he welcomed then Iranian president Mahmoud Ahmadinejad to Zimbabwe. Zimbabwean government official is quoted by the local newspaper as saying that a memorandum of understanding was signed, despite warnings in 2011 by the United States of “ramifications for countries that decline to observe their international obligations.” The official added that only a handful of people at the top of the African country’s government knew about the deal. The country’s uranium reserves, estimated at 45,000 tons, are said to be mixed with other minerals and groundwater, making extraction costly; an assessment that has led analysts mentioned in the report to claim that it could take a long time before the minerals are ready for export and that Zimbabwe was simply trying to keep its options open in the meantime. President Mugabe’s military henchmen have signed arms trade agreement worth millions of dollars with North Korea, in return for allowing Pyongyang access to Zimbabwe’s controversial Kanyemba district, which has sparked a uranium mining race pitting Iran and other powerful nations. Kanyemba district is about 160 miles north of the capital, and is believed to be holding significant uranium reserves, first discovered in the 1970s by German prospectors, but never exploited due to low world prices at the time. Several other countries have sought the rights to mine Zimbabwe’s untapped uranium deposits, and these include Russia, China and a failed bid by neighbouring South Africa and Namibia, as they scramble for the Yellow cake which is a key ingredient needed for the production of nuclear bombs. Some metallurgists, maintain that the Kanyemba uranium reserves are very large in quantity, and estimate based on initial exploration of the fields that, at least 450,000 tonnes of uranium ore is available, with about 20,000 tonnes being extractable uranium. The Chinese are also believed to have approached Zimbabwe offering finance and construction projects in return for mining rights. Although Iran has its own uranium deposits they are not as pure as those found in other parts of the world. Experts believe the Islamic state has already stockpiled 182kg of enriched uranium, but would require around 250kg to build a nuclear bomb. Following his first term inauguration, Iran’s president Hasan Rouhani Iran’s promised to follow a ‘path of moderation’ and bring more openness over the country’s nuclear programme. But he stopped short of saying they would consider halting the uranium enrichment programme and accused the United States of seeking any excuse to confront the country over its nuclear ambitions. They insist the programme is peaceful and geared soley towards generating electricity and producing radioisotopes to treat cancer patients. Mr Rouhani’s predecessor Mahmoud Ahmadinejad, met with President Mugabe in 2010, when the African leader described the Iranian’s nuclear ambitions as a ‘just cause’. Before stepping down in June Mr Ahmadinejad, took a foreign trip to Niger, the world’s fourth-largest uranium producer. 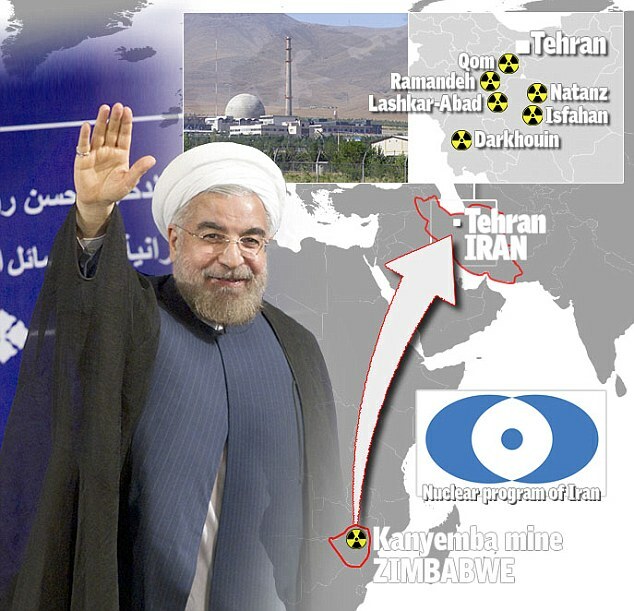 Iran has six uranium enrichment plants and are also understood to have activated a heavy-water production plant to produce plutonium for a nuclear bomb. But satellite images showed clouds of steam emerging from the site, which is 150 miles south-west of the capital Tehran.